Trump worship is pretty rife throughout the Independent and Alternative Media, with many big sites putting their full weight behind supporting Donald Trump as the next US president. One can only assume that the researchers running those sites, although they are surely aware of Trump’s many faults, so desperately want a president that is not another Illuminati insider that they willing to back a perceived “outsider.” They also appear to be willing to disregard Trump’s own words as evidence that he could be every bit of a tyrant as many presidents before him. Trump has long been paying politicians off for his projects and rubbing shoulders with the Manhattan elite, so it’s hardly accurate to call him an outsider. However, regardless of whether he is an insider or outsider, he has shown definite and troubling signs that he could use the colossal power at his disposal to augment the fake war on terror, introduce stricter domestic laws and in general reduce the freedom of the average American. Is the spate of Trump worship indicative of a healthy dose of cognitive dissonance surrounding the man? As I pointed out in the article Trump Calls for 2 Shutdowns: Wants No Muslims to Enter US and Internet Closure, Donald Trump is a mixed bag. Yes, he has made some positive and informed comments showing he is aware that 9/11 was an inside job (including blasting former PNAC member Jeb Bush); that he is aware of the monstrosity of GMOs; that he is aware that AGW or manmade global warming is a false notion; that he is aware of a possible vaccine-autism connection; and that he supports Russia really wiping out ISIS (unlike the US-UK-NATO alliance which just pretends to). However, he has combined his insight into these issues with low-level demagoguery, racism and xenophobia. 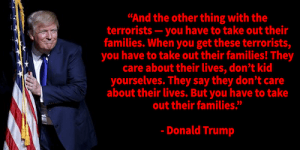 He probably thinks he has to act all rough and be the tough guy to get elected president, but in doing so, he has made some boastful and alarming comments indicating his intention to kill terrorists’ families (kill civilians), escalate torture, ban all Muslims from entering the US and even shut down the internet. Of course, much of the rest of the non-US world sees America as the world bully and major terrorist nation of the world, but arrogance goes along with ignorance, as they say. Playing the uninformed tough guy isn’t going to produce a very good result in the Middle East, where many Muslims have begun to hate the US and the West for their foreign interventions and meddling. If Trump actually did some research, he would discover that the US created and has been funding ISIS all along, as a way to create chaos in the Middle East, and help achieve their long-term geopolitical goal of encircling Russia and capturing Eurasia (see the Wolfowitz Doctrine). Rather than murdering innocent civilians, there is a much simpler way to stop terrorists: stop funding them, stop invading and infiltrating their nations, and stop giving them an excuse to hate and retaliate. In this presidential candidate debate, Trump made reference to Middle Eastern terrorists beheading Christians, and stated he would “bring back waterboarding, and bring back a hell of a lot worse than waterboarding.” An incredible statement, given how much indignation and debate the people of the US and the world went through just 3-4 years ago with the revelations of the Bush-Cheney administration’s penchant for torture. The public backlash against the US using enhanced interrogation torture was intense, with many rightly pointing out that the US was becoming the enemy it was fighting by engaging in such tactics – which prove useless anyway since anyone being tortured says or confesses anything just to make the pain stop. How exactly does the Trump worship continue in the face of such tyrannical suggestions? Trump has repeatedly made racist, xenophobic and Islamophobic claims throughout his campaign – way too many to list here. This has included the claim that Mexico only sends its worst citizens to the US, a proposal to ban all Muslims from entering the USA (“a total and complete shutdown of Muslims entering the United States” according to Trump’s press release) and a proposal to shutdown the internet to supposedly “fight Islamic terrorism.” More elimination of freedom based on a faulty understanding on the real causes of terrorism (research the US-UK-Israeli axis for more info) – which is a constant theme throughout Trump’s comments and ideas. Trump: The Next Tyrant President? Some have commented that, with the rise of Donald Trump and all the Trump worship that is surrounding him, they now understand how a demagogue like Adolf Hitler came to power among supposedly rational and level-headed Germans in the 1930s. There is something enticing about someone who speaks passionately, promises to save their nation or make it great again, and bases some or most of their campaign on demonizing the “other” (whether it’s Jews, Muslims or any kind of group). However, that kind of thinking is simplistic and dangerous. We’re one human race, regardless of race, religion, skin color or sexual orientation. We’re all in this together. How often are we going to fall for the politics of separation? Thanks but no thanks – I’ll pass on the Trump worship. We don’t need a new president: we need a new system based on a new consciousness. Lol, there is no evidence Trump is a racist, and you clearly misunderstood what he was saying about the internet. Stop believing leftist propaganda.